Intensify and define your eyes with Gun Smoke Powder Eyeliner . This powder eyeliner can be used wet or dry with the aid of an eyeliner brush and is perfect for creating anything from the cat eye to a fine line. The richly pigmented powder brushes on easily, enhancing and contouring your eyes. Sample Size good for 1-3 uses. Absolutely love this eye liner.... Not only does it look great but it lasts all day. I had never used a powder version and love it..
Bandit is a beautiful mahogany color; if you are doing a brown-ish neutral look, it would be amazing. Didn't work well with the greys/ purples I usually wear, but the quality of the product was top notch. Went on smoothly with no fuss and didn't smudge or irritate my eyes. Love this eyeliner, Bandit. I have been using it as a dry powder and loved it, today I used it as a wet and it stayed ALL DAY (I mean from 7:30am this morning to now @9:14pm. Love the color goes really well with my very dark hair...not black, not brown, not indigo... LOVE IT! Went on easily and stayed on ALL day! Love it! I tried this out a few weeks before my wedding and LOVED it! I use an angled brush and lightly dip it in water before using the powder and by doing that, it is very precise. The day of my wedding, I ended up BAWLING down the aisle and feared for the worst. After the ceremony, I looked in the mirror and the liner hadn't moved a bit! It looked as fresh as when I first applied it. This stuff DOESN'T budge! It's actually a bit tough to get off with makeup remover but I'd prefer that than having it smudge right away. I gave a sample to my mom who has been trying high end brand liners but every one of those smudged. She LOVED this one as well. Love that it is not bad for you either! Thank you Cowgirl Dirt! I ordered this not realizing it was the powder version. I'm not a powder eye liner fan because it takes to long to apply and too messy. But with that put aside, this eye liner did stay on quite well and I can see how this could double as an eye shadow. I ordered the Fence Post which was a smokey gray color. This would be a great eye liner for someone who likes powder eye liner. I've tried this powder eyeliner in grey and black and I like both. I am accustomed to painting on eyeliner with a fine brush, and I think that this one goes on just as well or better as conventional brands. There is an art to getting enough water on your brush to catch just enough of the powder, but it goes on very well, and you can keep adding a bit more to get the desired level of darkness. I love the black eyeliner. It stays on all day with minimal smearing, particularly if you use with the cream shadow. Never before has using a powder eyeliner felt so great! The natural ingredients in Gunsmoke Powder Eye Liner makes this product something to feel good about. 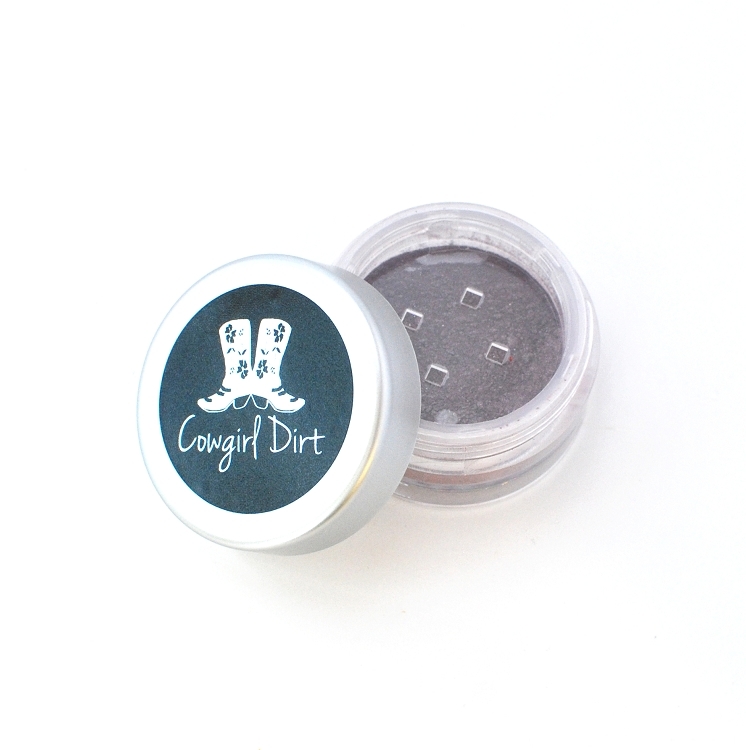 Silk Powder: This moisture balancing powder makes Cowgirl Dirt® Powders great for every skin type. As an added bonus it also contains amino acids and protein to give your skin an added healthy bonus. Gunsmoke Powder Eye Liner can be applied dry for a subtle dusty look, or wet for a dramatic flare. When applying wet be sure to use a thin edged eyeliner brush. Dampen the brush and apply a light coating of powder to it. Tap off any excess powder from the brush before applying to ensure exact application.